The MSI GS65 Stealth Thin is pretty much our favorite gaming laptop in every way, with a classy design and the performance of hyper car to match. However, its most limiting factor is price – and this is where the 15-inch MSI GF63 comes in to sweep you off your feet. Sporting an almost identically sophisticated aesthetic, a nearly bezel-less display and respectable specs, the MSI GF63 is an ultra-slim machine designed for those on a budget. Starting at only $999, the MSI GF63 will be one of the most affordable gaming laptops available later this June. MSI tells us that at this price the 15-inch gaming laptop will feature an Intel Coffee Lake Core i7 processor – there are plans for an even lower cost Intel Core i5 model in the future – paired with either a Nvidia GTX 1050 or 1050 Ti. On the low-end, the MSI GF63 comes stock with a hard drive boosted by Intel Optane Memory for SSD-like performance as well as 8GB of RAM. From there, the next configuration includes an 128GB SSD that and can be specced up to 512GB. Strangely, MSI tells us that users won’t be able to upgrade the MSI GF63, which makes it an oddity in the company’s otherwise upgrade-friendly lineup. Interestingly, Asus announced an almost direct competitor to the MSI GF53 at Computex 2018 in the form of the Asus ROG Strix Hero II. Though it’s considerably more expensive at $1,699 (about £1,270, AU$2,240), it’s also potentially better equipped with an Intel Core i7-8750H, GTX 1060 with 6GB of memory, a Full HD 144Hz display, 16GB of 2,666Mhz RAM, 256GB PCIe SSD and a 1TB FireCuda SSHD. The MSI GF63 is practically a carbon copy of the MSI GS65 Stealth Thin, and that’s perfectly fine for us because that notebook had an absolutely brilliant design. Like its high-end cousin, this gaming laptop features a 82% screen-to-body ratio with bezels just 4.9mm, cramming a 15.6-inch display into a 14-inch frame. Likewise, the two laptops share a nearly identical layout of body lines as well as keyboard and trackpad placement. The only real way of telling them apart, visually speaking, is the MSI GF63 carries on the classic gamer black with red trim color scheme – though the latter is kept to a much greater minimum than in years past. Rather than having the MSI GS65 Stealth Thin’s intricate lattice of copper-toned metal around the vents, you’ll just fine some bit of plastic protecting this machine’s bare heat sinks. Most of the laptop’s chassis is made of metal including the screen lid and keyboard deck. The bottom panel, meanwhile, is a mixture of plastic and metal – MSI explained it went this route to give the laptop some variance in feel and look. 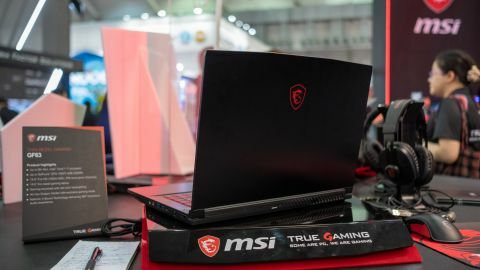 Altogether, the MSI GF63 looks like a meld between the company’s current flagship gaming laptop and the outgoing MSI GS63VR Stealth Pro. Although, we only very briefly got to play around with the MSI GF63 – in which we played around in Windows and launched a few applications – our experience with the Nvidia GTX 1050 and 1050 Ti leads us to believe this machine will have no problem handling eSports games and the most popular shooters like Fortnite and Overwatch. We’re a little dubious as to how much faster Intel Optane Memory will make the hard drive storage feel, as our own testing in the past revealed a very slim difference on a desktop PC. MSI also promises more than seven hours of battery life, but as with all claims like these, we’ll remain skeptical about it until we can actually test it for ourselves. MSI GF63 makes the portable, thin-and-light gaming laptop category more accessible than ever before. Slim bezels are still a luxury even on Ultrabooks and to see it on a machine equipped with an Intel Core i7 CPU and discrete graphics is amazing. We’ve got high hopes that this laptop will have all the power for gamers just starting out as this affordable price point is currently unbeatable.